Amazonian rain forest tribes have made use of Suma as a potent sexual tonic and energy booster for at least 300 years. Recent clinical studies have demonstrated its efficacy in stimulating sexual performance, especially when mixed with Damiana. Furthermore, the root has been highly effective in treating chronic fatigue due to its anabolic-like substances and concentration of 19 amino acids, vitamins, and trace minerals. In South America Suma is known as Para Toda (which means "for all things") and as Brazilian ginseng, since it is widely used as an adaptogen with many applications (much as "regular" ginseng). The indigenous peoples of the Amazon region who named it Para Toda have used Suma root for generations for a wide variety of health purposes, including as a general tonic; as an energy, rejuvenating, and sexual tonic; and as a general cure-all for many types of illnesses. 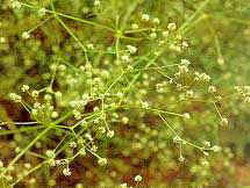 Suma has been used as an aphrodisiac, a calming agent, and to treat ulcers for at least 300 years. It is an important herbal remedy in the folk medicine of several rain forest Indian tribes today. Suma has also been called "the Russian secret," as it has been taken by Russian Olympic athletes for many years and has been reported to increase muscle-building and endurance without the side effects associated with steroids. This action is attributed to an anabolic-type phytochemical called beta-ecdysterone and three novel ecdysteroid glycosides that are found in high amounts in suma. Japanese researchers filed a U.S. patent in 1998 for a proprietary extract of Suma (which extracted the ecdysterone and beta-ecdysterone); it claimed (through various in vivo and in vitro studies) that their compound maintained health, enhanced the immune system, and had a tonic and an anti-allergenic effect. A French company also filed a U.S. patent on the topical use of these ecdysterone chemicals, claiming that their Suma ecdysterone extract strengthened the water barrier function of the skin, increased skin keratinocyte differentiation (which would be helpful for psoriasis), gave the skin a smoother, softer appearance and, also, improved hair appearance. The specific saponins found in the roots of Suma include a group of novel phytochemicals that scientists have named pfaffosides. These saponins have clinically demonstrated the ability to inhibit cultured tumor cell melanomas (in vitro) and help to regulate blood sugar levels (in vivo). The pfaffosides and pfaffic acid derivatives in Suma were patented as antitumor compounds in several Japanese patents in the mid-1980s. In a study described in one of the patents, researchers reported that an oral dosage of 100 mg/kg (of suma saponins) given to rats was active against abdominal cancer. The other patents and Japanese research report that the pfaffic acids found in Suma root had a strong in vitro activity against melanoma, liver carcinoma, and lung carcinoma cells at only 4-6 mcg of pfaffic acids. However, it should be noted that this equates to taking 400 to 600 g (about 1 pound) of natural Suma root daily to achieve the therapeutic dosage of pfaffic acids reported to demonstrate toxic activity against these cancer cells. As such, it will probably be left up to the pharmaceutical companies to provide synthesized versions of these chemicals in therapeutic amounts. Suma Root is classified as an aphrodisiac, energizer, cognitive enhancer, sexual performance enhancer, and anti-cancer supplement.